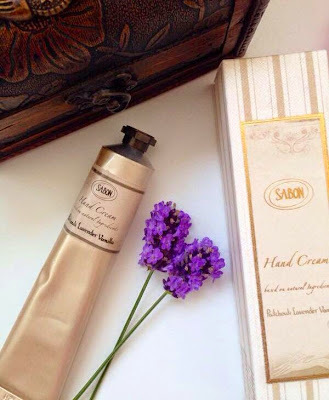 Sabon, bath-and body line was born in 1997 in Israel with its handmade lavender soap. The line has an air of luxury, thanks to its pretty vintage golden packaging. All the soaps, candles, and pretty ceramics are handmade. The rest of the products are not. Patchouli Lavender Vanilla hand cream. A great unisex lotion, with a light and non greasy texture makes dry, chapped hands inexcusable. Gently enriched with essential oils, silicone, vitamin E and C, this yummy experience will leave your hands, nails and cuticles feeling fresh and smooth and looking significantly younger. When you are a make-up artist, your hands need to be extra soft at touch, clean and nice smelling. Nobody will enjoy a pair of smelly dry rough hands on their face. First impression: very nice packaging.The gold accents makes it look very classy. Final impression : Omg this hand cream smells divine and I wanna put it all over my body not just on my hands ! Smells like you just got off the spa and very soothing. Love, love, love it ! The cream absorbs fast , the only thing you will feel on your hands is the divine sweet scent of vanilla and lavender. The scent is subtle enough to use on an airplane without annoying anyone but also pronounced enough to be be warm and relaxing, due to the lavender. It smells great, and melts into your hands instantly, I love the fact that skin feels only soft , velvet and not greasy or oily, like with some other hand creams. pretty packaging. The tube is made out of soft metal not of plastic like with most hand creams we use. It fits perfectly in my make-up bag or in a purse, and smells delicious! I will admit that the scent of this cream lotion is what makes me so addictive to it !Less is more when it comes to this product, a little goes great ! On the packaging you will see written "made with natural ingredients ", it does contain natural ingredients but also contains preservatives and colorants. At Sabon, only the organic line is 100% natural. Sabon doesn’t test on animals, and also practices green initiatives. This hand cream will help condition your skin and nails and also give you a relaxing spa experience. Now if you wander how much you have to pay for such a relaxing spa experience, my answer is around 11 euro for 50 ml of product. Once again I will say that the worst thing about a great and divine product is the price !!! I hate the price! I will rate this product with 5 stars because the scent it made me almost crazy, in a good way. This is not a sponsored post and none of these products were gifted to me. All opinions are my own and I genuinely like and use these products. As cumpara toate produsele cu aroma de lavanda, pare o crema buna ce se absoarbe rapid in piele. Like it! Spre deosebire de alte produse cosmetice cu miros de lavanda, crema asta are un miros extrem de natural si non-chimic. Sounds great! I wish I could smell it, by your description it seems addictive!